For Arizona’s utilities industry, meeting an ever-increasing demand for power is an ongoing challenge. But the major players already have made some headway to meet the need while factoring renewable energy into their game plans today and tomorrow. 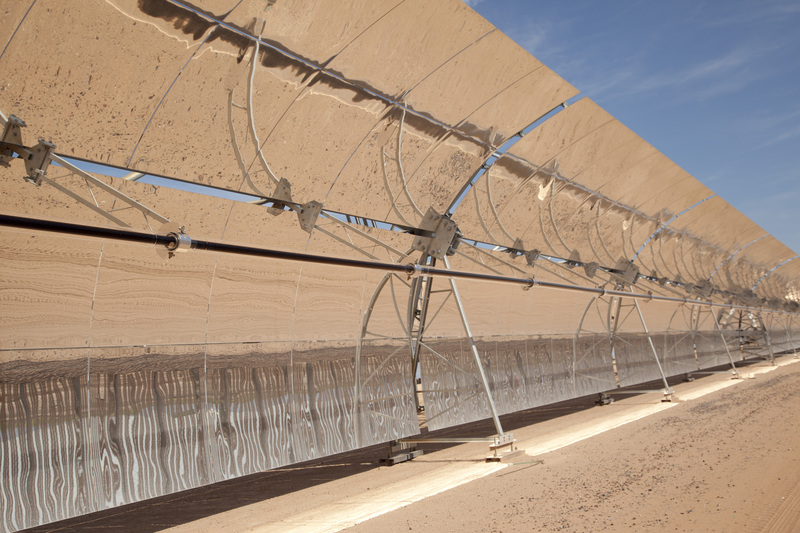 Parabolic trough plant Solana is the first solar plant in the nation with thermal energy storage allowing for electricity to be produced at night. To decide where it is headed, Arizona Public Service (APS) went through a three-year stakeholder process to develop its 2017 Integrated Resource Plan mapping out how the utility expected to meet its customers’ projected energy needs for the 15 years to follow. For APS, solar will continue to be a focus when it comes to clean energy. It expects the state’s energy needs to be 50 percent higher by 2025. To respond, the utility expects increased use of solar energy along with energy efficiency to meet nearly half of the anticipated new energy growth. Since 2011, customers have been benefitting from the clean energy produced by multiple grid-scale solar plants that APS operates under its AZ Sun program. The nine plants are in locales across the state, including Gila Bend, Buckeye, Chino Valley, Hyder Valley, Yuma and Glendale, giving APS access to plants generating more than 437.2 megawatts. The site likely getting the most attention is the Solana Generating Station, a 280-megawatt parabolic trough solar plant just outside Gila Bend. It’s the world’s largest solar plant of its kind featuring thermal energy storage, meaning it captures power of the sun, stores it and continues to deliver it to customers for up to six hours after sunset. Although owned by Atlantica Yield & Liberty Interactive Corp., APS purchases all of the power generated. APS predicts a significant increase in private rooftop solar capacity and support from energy efficiency programs. A few years ago, the company counted more than 1 million installed solar panels in its portfolio, which collectively generated more than 1 gigawatt (551 megawatts of rooftop solar installations and 499 megawatts of utility-scale solar). But the utility is not just banking on the sun being up to meet its needs. Batteries also fit into the future as the Integrated Resource Plan calls for adding up to 500 megawatts of energy storage over the next 15 years. The batteries will bring more clean energy to APS customers when it is redistributed at peak customer usage times later in the day. Three grid-scale batteries already operate plus a 50-megawatt battery is being created in partnership with First Solar for use in 2021. Plans call for more to come as APS recently wrapped up a process to select companies that will equip solar plants it uses with a total of up to approximately 106 megawatts of battery storage. As it does with its rooftop solar installation program, APS also is turning to residential partners for battery use. Its Storage Rewards program offers customers in targeted areas with a residential battery storage option using an APS-owned battery system. In exchange for a bill credit, the company manages use of the battery as the company studies the impact of using battery storage as an energy source during high demand periods. For Salt River Project (SRP), its Sustainable Portfolio has the goal of meeting 20 percent of the utility’s retail energy requirements through sustainable resources by 2020. Considering the company reached the 17.25 percent mark when its fiscal year 2018 ended, SRP is on track to reach the new mark. Like APS, solar is just one of the renewable energy sources for SRP. It’s no surprise that SRP continues its tradition of using hydroelectric dating back more than a century when a byproduct of its new water-delivery system from the new Theodore Roosevelt Dam was power. But the mix is even more diverse with geothermal and wind and biomass as sources. Also, not all sources are necessarily homegrown. One example is SRP purchases geothermal energy generated at the Cove Fort Geothermal Project in Beaver County, Utah. Batteries also figure into SRP’s plans. In a partnership with NextEra Energy Resources, the utility opened the Pinal Central Solar Energy Center (PCSEC), Arizona’s largest utility-scale solar energy center paired with a battery storage system. The 20-megawatt solar photovoltaic generation facility comprised of 258,000 solar panels on land east of Casa Grande can generate enough solar energy to power 5,000 homes and store excess in a 10-megawatt lithium-ion battery system. In another project, SRP has partnered with AES and Fluence to create a long-lasting, reliable energy storage solution for central Arizona’s power grid, as well as the company’s electric customers. Construction of the 10-megawatt facility — the first stand-alone battery storage system of this type in Arizona — began in May. Based in Chandler, it will be charged by an SRP distribution station. Also in May, SRP launched a program to support the installation and use of battery storage systems for its residential customers. The Battery Storage Incentive Program provides up to $1,800 for customers who purchase and install qualifying lithium ion battery technologies. The program was made available to a limited number of residential electric customers on a first-come, first-served basis during a 36-month period. Tucson Electric Power (TEP) already gets 13 percent of its power from renewable resources, with enough wind and solar energy to power more than 115,000 homes. For utility-scale solar, the utility gets more than 250 megawatts from a combination of plants that it owns as well as power that it purchases. It also taps into more than 200 megawatts from residential and commercial rooftop solar systems. For wind power, TEP draws from the Red Horse Wind and Macho Springs sites. Red Horse is a 30-megawatt wind farm west of Willcox that includes 15 wind turbines on 220 acres. The project is owned by a subsidiary of Torch Renewables Energy. The Macho Springs facility is on approximately 1,900 acres northeast of Deming, N.M., and includes 28 turbines mounted on 264-foot-tall towers. Expect more use of renewable energy to come as TEP plans to double its wind and solar capacity with three new systems that are expected to be completed by 2021. They include a 100-megawatt solar array paired with a 30-megawatt battery storage system, as well as a 100-megawatt wind system and one that will be rated at 150 megawatts. By 2030, TEP plans to have three times as much wind and solar energy as it does now. That’s enough to power almost every home in the Tucson area! Under the utility’s 30 by 30 Plan, 30 percent renewable power will be delivered to customers by 2030—nearly twice the level required by the state in 2025. The Central Arizona Project (CAP) is known as the largest source of renewable water in Arizona. What may not be evident is its being the biggest electricity user in the state. More than 2.8 billion kilowatt hours of energy are needed each year to deliver more than 500 billion gallons of Colorado River water to 80 percent of the state’s population. That’s largely because water is pumped 336 miles essentially uphill between Lake Havasu and the end of the system south of Tucson. Just like any responsible company today, there are considerations by CAP of controlling costs while seeking ways to reduce its carbon footprint. That’s especially true as closure of the coal-fired Navajo Generating Station near Page, a key source of power for CAP, appears imminent. An alternative energy source for the water supplier was revealed recently with news of a 20-year agreement with AZ Solar 1 to sell it power for just 2.5 cents per kilowatt-hour—one of the lowest-cost contracts of its kind—from a planned 30-megawatt solar plant. The facility will be owned, operated and built somewhere along the canal route by Origis Energy USA, with the first electricity delivery expected by the end of 2020.